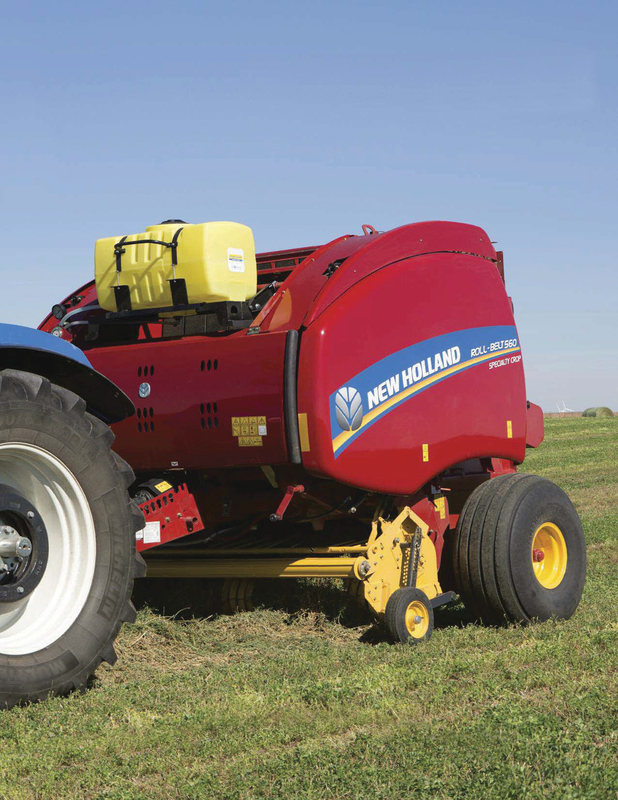 The CNH plant in New Holland, PA, manufactures, among other farm equipment, these round balers. The plant’s deeply rooted in a World Class Manufacturing system aimed at eliminating waste and loss by focusing efforts to achieve zero defects, breakdowns and waste. The cushion between the metalforming and fabricating shop and assembly lines at the sprawling New Holland (PA) Agriculture plant of CNH Industrial is a scant single day. In short, the shop stamps and fabricates parts when they’re needed on the lines, where the firm’s balers, mower-conditioners, harvesters and other farm equipment come to life. Reduced inventories is just one tenet of the CNH World Class Manufacturing (WCM) system, with tentacles reaching into total quality control, total productive maintenance and just in time. As explained by manufacturing engineer Corey Messner, WCM initiatives aim to prevent waste and loss by zeroing in on achieving zero defects and breakdowns, and—most noticeable in the plant’s pressroom—minimizing press-setup times to boost equipment OEE and ensure punctual part delivery to the assembly lines. “Recently, our shop has been implementing a kitting process to supply a small internal warehouse from which the assembly lines pull parts and subassemblies as needed,” says Messner. Those activities have helped the company shrink lot sizes, which of course means more die changes in the shop. The plant’s pressroom houses six mechanical stamping presses, ranging from 165 to 400 tons. All but one are hand fed with blanks—some laser-cut on the firm’s laser-cutting machine. The one coil-fed press is the plant’s newest, an Aida 200-metric-ton servo press (84- by 33-in. bed) acquired in 2014. It’s a workhorse, tasked with running some 80 different dies, half of which run at least once per month. And, the press often tackles the plant’s most challenging parts. The servo press came equipped with the latest in quick-die-change technology: a permanent-electromagnetic-die-clamping system (a Stamp Tec setup from Tecnomagnete). 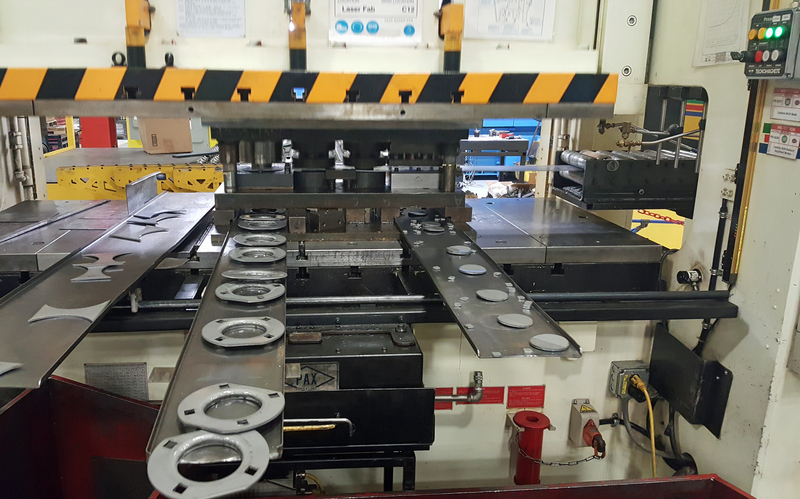 One of six stamping presses supplying stamped parts to CNH assembly lines is this 200-metric-ton Aida servo press, equipped with a Tecnomagnete magnetic die-clamping system. Green lights on the system’s control panel (top right) indicate proper clamping. Here, the servo press forms bearing housings from 0.157-in.-thick hot-rolled Type A1011 steel at 53 strokes/min. The WCM agenda calls for single-minute exchange of dies (SMED), the Japanese-born lean concept calling for production-changeover times measured in the single digits (less than 10 min.) Messner notes that the pressroom is right there. The Tecnomagnete Stamp Tec setup is a round-pole bi-mag clamping system that, says company literature, “eliminates the resin previously used in all square-pole products.” Magnet clusters, says Messner, are embedded in 2-in.-thick steel plates that bolt to the press ram and bolster. (The shop tested the system on the ram plate of another press, a 165-ton standard mechanical press, before installing it on the ram and bolster of the servo press). The magnetic setup, Messner explains, is a universal process that easily adapts to the shop’s dies. Dies are changed using a fork truck; a dedicated die cart maneuvers larger dies around the pressroom. Another task the shop had to complete to accommodate the die-change system: adding nitrogen-gas springs to about 20 of the dies that run in the servo press.